Last night’s council meeting had to consider a motion to re-join Timber Towns, an advocacy group whose purpose is to represent the interests of councils in relations to logging. I am pleased to report council voted to not re-join this advocacy group in a four/five vote against the motion. 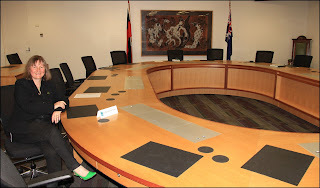 In what continues to be a change to the culture and custom of Yarra Ranges Council, the Mayor once again moved the motion to re-join and was seconded by Cr Callanan. Cr Child talked about the serious socio economic issues in the O’Shannassy and Ryrie wards and how the timber industry was an important employer across those regions. He went on to quote economic data around the timber industry in what I would describe as cherry picking to suit the argument. He talked about $30.7million the timber industry contributes to the Yarra Ranges economy, the $19.9million contribution in support services to the industry and the 62 people in Powelltown who are employed directly in the industry. I could not support the motion, in speaking against the motion I wanted to clarify for councillors the true economic picture of the industry in Yarra Ranges, using data sourced from the Yarra Ranges Economic Development Department. I acknowledge the importance of the industry to townships like Powelltown but could not see how being a member of Timber Towns would translate in protecting and growing those jobs. In terms of the economic data, the $30.7milion contribution is a very small part of what is a $10.5billion economy, it represents 0.2% of the total economy in the Yarra Ranges. The $19.9million in support services is measured in support across the agricultural sector, it includes the horticulture, viticulture and floriculture industries, there will be a component that does support the timber industry but very small in terms of the size of those other agricultural industries in Yarra Ranges. There are 56 direct jobs in the timber industry, out of 35,000 jobs in Yarra Ranges. There are 780 road transport jobs and a very small percentage of this figure could be attributed to local timber cartage companies. There are 444 jobs in Saw Mill, Wood & Paper Product Manufacturing, these cannot all be attributed to sawmilling as the data includes prefabricated wooden building manufacturing and wooden structural fitting and component manufacturing. I don’t doubt that the community of Powelltown needs support, it was my view that we’d be better off supporting that community directly and giving any money we are considering for Timber Towns directly to them for community projects. We know that the timber industry is in contraction, supported by evidence given by Vic Forests at the recent Supreme Court case re logging in Toolangi. I’ll do more on this story later in the day in terms of what councillors said for and against the motion. Cherry picking in order to support an argument seems to be a popular thing to do from governments and agencies. Glad you were able to paint a better picture......and even more pleased that the motion was not supported - yay!